A Japanese opposition leader on what is wrong with the changes to The Guidelines for Japan-U.S. Defense Cooperation. 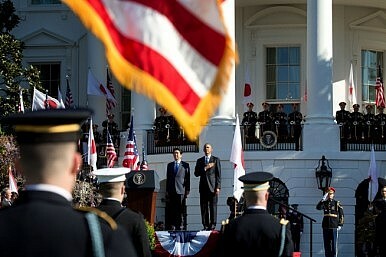 The governments of Japan and the United States of America have agreed to revise The Guidelines for Japan-U.S. Defense Cooperation for the first time in eighteen years. This revision is extremely problematic both in terms of its actual content and in the way that it is being carried out. First, with regard to the content, the new Guidelines call for “seamless…bilateral responses,” and the section referring to “situations in areas surrounding Japan” included in the previous Guidelines has been deleted. This is a very significant change since it indicates Japan and the United States will be able to undertake joint military action anywhere in the world. Of course, Japan and the United States need to engage in joint military action for the sake of Japan’s defense and security. I have no intention of denying this fact in itself. However, the deletion of the concept of “situations in areas surrounding Japan,” allows the Self-Defense Forces to be dispatched anywhere in the world, and this clearly violates the Constitution. In 1999, the Diet passed the Law Concerning Measures to Ensure the Peace and Security of Japan in Situations in Areas Surrounding Japan (the Situations in Areas Surrounding Japan Law). However, the Japanese government’s original legislative draft did not place any limit on the “situations in areas surrounding Japan” that would require action and it read as if Japan and the U.S. ought to undertake joint military action should any situation occur in the areas surrounding Japan. I think it likely that the Japanese government, in particular the Ministry for Foreign Affairs, was pressured by the United States to use such wording. At that time, I happened to be in a coalition with the Liberal Democratic Party, in my capacity as the leader of the Liberal Party. I strongly protested the content of the government proposal, stating that “This wording infringes the basic philosophy of the Japanese Constitution.” As a result, the wording was changed to “situations in the areas surrounding Japan that will have an important influence on Japan’s peace and security, including situations that could develop into a direct armed attack on Japan if left unaddressed.” Thus, my intervention forced the legislation to be revised so that Japan and the U.S. could only take joint military action under these particular circumstances. However, in the revised Guidelines this concept of “situations in areas surrounding Japan” has disappeared, and Japan and the U.S. can now engage in unlimited joint military operations. This is congruent with the Abe Cabinet’s decision of July 1 last year that made it possible for Japan to exercise the right to collective self-defense. Both of these run counter to the philosophy of the Constitution, in particular Article 9, and are clear violations of the Constitution. If the Abe Cabinet is determined to allow the use of the right to collective self-defense, and to delete references to “situations in areas surrounding Japan” from the Guidelines, then it should first propose Constitutional revisions to the public, discuss these in the Diet and then ask the Japanese people to give their verdict on the issue. In this sense, this revisions to the Guidelines are problematic in terms of political methodology, since the order that has been employed is completely the opposite to that. The government should first revise the Constitution, if that revision is supported by the Japanese people, and only after that allow the use of the right to collective self-defense and delete “situations in areas surrounding Japan” from the Guidelines. That is the right order. However, Prime Minister Shinzo Abe’s approach is first to reach an agreement with the U.S. on the Guidelines and then to use this fait accompli to change Japanese law. The government is using U.S. pressure as a pretext to build up fait accompli and to move things in their preferred direction. But this is hardly appropriate behavior for an independent sovereign state that extols the virtues of constitutionalism. If we recall the circumstances leading up to World War II we see that the Japanese people continued to give tacit approval to arbitrary actions by the military, saying to themselves, “Well, since things have already gone this far, then there is no help for it. There is nothing that we can do.” This ultimately led to the Pacific War. It is a peculiarly Japanese way of going ahead with things in a gradual drip-drip-drip way so as to create an atmosphere where people just end up saying “Well, there’s nothing we can do about it.” Our remorse for the past should lead us to conclude that we must never decide things in that way ever again. From this perspective, I believe the way in which the Guidelines have been revised on this occasion is extremely dangerous and nothing more than a mere palliative measure. I frequently describe the Japan-U.S. Alliance as the most important bilateral relationship for Japan. However, in a healthy alliance the partners would exchange views on an equal footing, come to a conclusion which both accept, and then go on to cooperate with each other. For Japan to say, “The United States says so, so there is no alternative for us but to agree,” is not the sign of an equal alliance, but rather of a superior/subordinate relationship. It is not my belief that Abe, in his heart of hearts, is really all that enthusiastic about toeing the U.S. line. Probably what he actually thinks is that if he can use American pressure to realize his own belief that Japan should be able to enhance its status in the world without being limited militarily by its Constitution, then that is the method he should use. That is a truly dangerous method. I believe that the path being taken by the prime minister poses grave risks for the future of Japan. It is my sincere hope that the Japanese people will come to fully understand this reality. What the Abe government plans goes beyond a constitutional amendment.